For the 2002 season Regulations for World Championship motorcycle road racing changed drastically with the V4-500cc class growing to V6-990cc prototypes only class. The series title also changed to become the MotoGP series. The NSR500 was virtually redundant overnight and phased out along with all other two-stroke motorcycles. 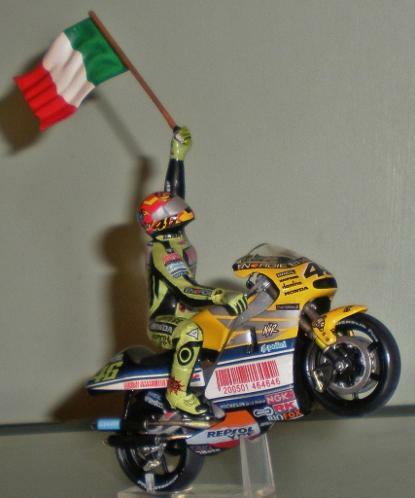 The 2001 World Championship was Rossi's first in the top level of motorcycle racing. He won 11 races in the final year of the 500cc class, adding to an already outstanding career record. After serving his apprenticeship, in Italian and European 125 series. Rossi moved onto the World stage in 1996. His first year was a mixture of lows, including several crashes and failures to finish, and highs, Rossi won his first Grand Prix at Brno on an AGV Aprilia RS125R. The following year he dominated the 125cc championship winning 11 out of 15 races. For 1998 Aprilia moved Rossi up to the 250 class alongside Loris Capirossi and Tetsuya Harada. Riding the RS250 he finished the season in second place in the championship, only three points behind Champion Capirossi. Once again his second year in the series was convincing and The Doctor collected 5 poles and 9 wins to become 1999 250cc world champion. Race French 500cc Motorcycle G.P. 18th May 2001. For the 2001 French G.P. Honda ran a special colour scheme due to the usual Nastro Azzuro sponsorship logos being banned. The Fairings carried bar codes and numbers relating to the race date and riders race number instead. Having won the first three 500cc Grand Prix Rossi faced the 4th round, at the le Mans circuit, with confidence. But this time he didn't have it all his own way. Rossi had a poor start from the front row falling down the field to 9th place. A determined fight back brought him through the pack up to a podium position 3rd place while Max Biaggi won the race leading home his team mate Carlos Checa. The Airfix/Heller tie up has provided us with a very nice range of 1/24th scale motorcycles; and the range has grown from the first set of four to include ten racing Bikes from the GP series and the later Motogp series (although a couple are really just decal changes). 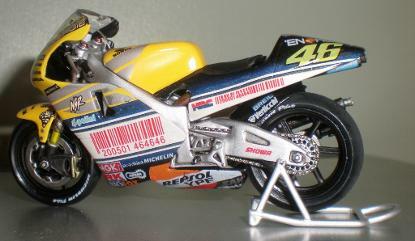 It is rare for kit manufacturers to do Motorcycles in 1/24th, they are usually in 1/12th or bigger. 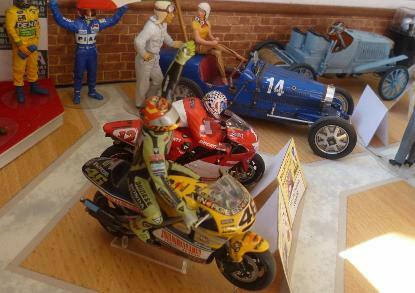 However, the decision to release these bikes was met with reasonable enthusiasm from modellers who made 1/24th scale cars and wanted motorcycles in the same scale. Sadly the range is not easy to come by despite several reissues but from time to time a bargain can be found. While these kits do not have the same level of detail as their bigger cousins they do have enough to build into very nice replicas.